Shopping for Fast and the Furious Remote and Radio Control Toys? 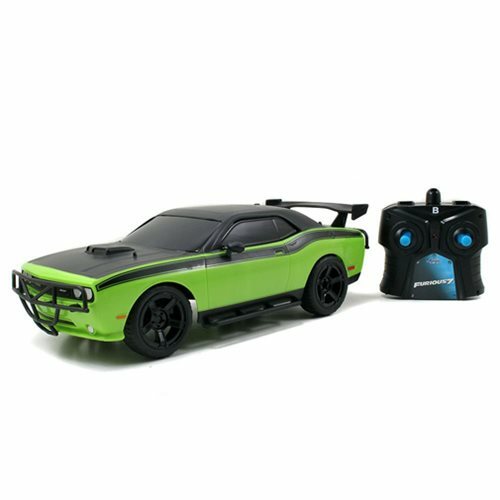 From Furious 7, navigate the iconic Dodge Challenger SRT8 in this aggressively styled 1:16 scale remote control vehicle ready for action! You call the shots as you lead the team on their crusade with this road-race inspired vehicle. Help Dom and his family as they continue the global exploits in the unstoppable franchise built on speed! Vehicle requires 4x "AA" batteries for vehicle and 2 "AA" batteries for controller (batteries are not included). Vehicle measures approximately 11-inches. Ages 6 and up. Transformers Hollywood Rides Bumblebee Camaro 1:16 RC Veh.